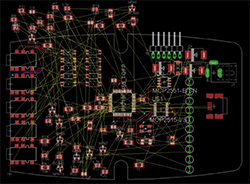 Although it’s derided for not being open source, EagleCAD is an extremely popular piece of schematic and PCB layout software. Most of the popularity is probably due to the incredible amount of part libraries – it’s certainly not the features Eagle has to offer or its horrible scripting capabilities. [Rob] had enough of the lack of good scripting support in Eagle, so he’s been spending his time making Eagle’s ULP work with Python. 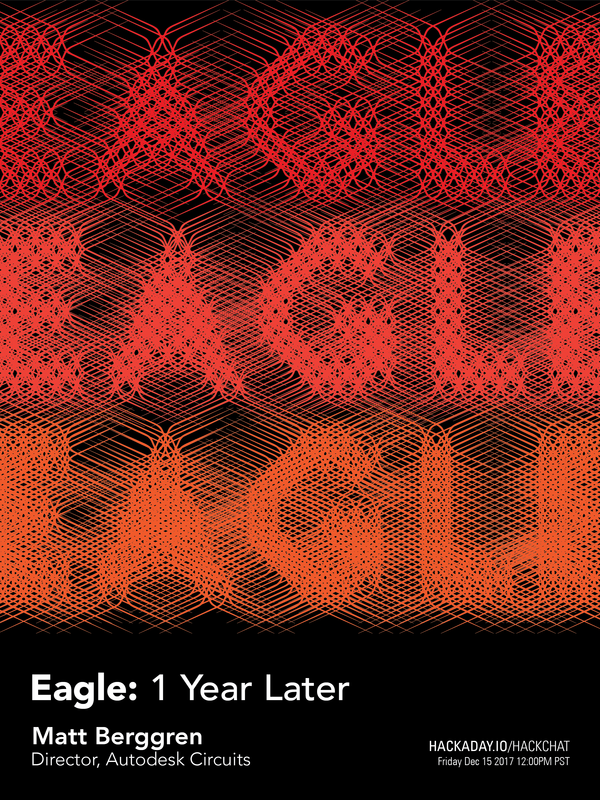 He’s only been at it a short time, but already it’s much more usable than the usual Eagle scripts. Below you can check out a pair of videos of [Rob]’s Python tools for Eagle in action. The first video goes through aligning a few symbols and creating a board outline (with proper curves!) from a DXF file. The second video shows exactly how valuable these tools are when laying out a board: imagine hundreds of LEDs and resistors automatically aligned to each other with a single click of a mouse. Beautiful. All the PyEagle stuff is available on [Rob]’s github, with a DXF importer, group manager, and alignment tool included. Now that everything’s Python, it’s easy to build your own tools without relying on Eagle’s odd ULP language. When you think about the difficulties of working with surface mount components, the first thing that often comes to mind is trying to solder those tiny little parts. Instead of soldering those parts by hand, you can actually apply solder paste to the pads and place all of the components on at once. You can then heat up the entire board so all of the parts are soldered simultaneously. It sounds so much easier! The only problem is you then need a solder stencil. You somehow have to get a thin sheet of material that has a perfectly sized hole where all of your solder pads are. It’s not exactly trivial to cut them out by hand. [Juan] recently learned a new trick to make cutting solder stencils a less painful process. He uses a laser cutter to cut Mylar sheets into stencils. [Juan] appears to be using EagleCAD and Express PCB. Both tools are available for free to hobbyists. The first step in the process is to export the top and bottom cream layers from your CAD software. The next step is to shrink the size of the solder pads just a little bit. This is to compensate for the inevitable melting that will be caused by the heat from the laser. Without this step, the pads will likely end up a little bit too big. If your CAD software exports the files as gerbers, [Juan] explains how to re-size the pads using ViewMate. If they are exported as DXF files, he explains how to scale them using AutoCAD. The re-sized file is then exported as a PDF. [Juan’s] trick is to actually cut two pieces of 7mil Mylar at the same time. The laser must be calibrated to cut all the way through the top sheet, but only part way into the bottom piece. The laser ends up slightly melting the edges of the little cut out squares. These then get stuck to the bottom Mylar sheet. When you are all done cutting, you can simply pull the sheets apart and end up with one perfect solder stencil and one scrap piece. [Juan] used a Full Spectrum 120W laser cutter at Dallas Makerspace. If you happen to have this same machine, he actually included all of the laser settings on his site. Looking at the looping GIF above you’re probably thinking, oh, another hard drive POV setup… Well… Not quite. This is one of [Dev’s] latest projects, and it is a planetary map that shows the angular positions of all 8 of the major celestial bodies from any given date between 1800 and 2050. 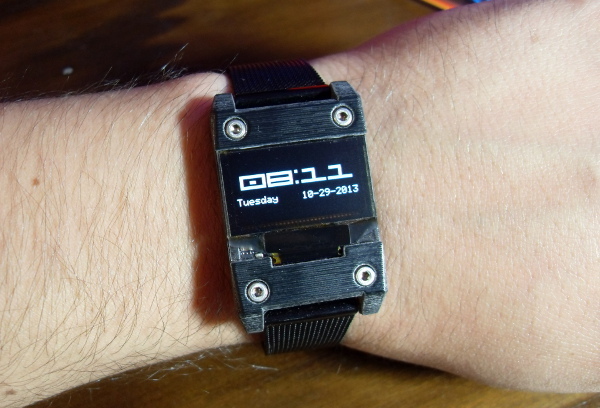 It’s also capable of showing analogue clock hands, the phases of the moon, and other simple graphics. The main unit is a hard disk, but [Dev] milled off many of the features on it to give it a more exposed, purpose-built look. He designed the LED bearing PCB from scratch using EagleCAD, which sits on the back of the drive, with the spindle poking through. It has 8 rings of 5 surface mounted LEDs, which shine through opaque plastic diffuser rings that he printed using Shapeways — they feature small recesses to fit snugly on the board over the LEDs. On the top level is a 1mm thick black disc of some unknown material that [Dev] had sitting around, which now has 8 holes machined into it in the exact position of the LEDs. A Cortex-M0 drives the LEDs using an LPCXpresso board which allows the LEDs to sit across only one byte of a hardware I/O port. On the software end, each rotation of the disk is segmented into three hundred and sixty 1 degree slices. This system allows him to achieve a circular resolution of 8×360 pixels at 25 frames per second. Not bad for a persistence of vision device! Stick around after the break to see the rather entertaining demo video of the device.